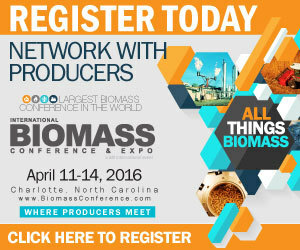 The U.S. EPA has posted the draft agenda for its April 7 workshop on the role of biomass in the Clean Power Plan. The free event is scheduled to be held in Washington, D.C., and will be broadcast live via webcast. The Port of Tyne recently recorded the largest ever cargo of wood pellets ever handled in a single shipment at the port. The MV Agnes bulk cargo vessel delivered a record 57,845 metric tons of wood pellets into the Port of Tyne. The U.S. EPA has scheduled a public meeting of the chartered Science Advisory Board March 31-April 1. During the meeting, the SAB is expected to conduct a quality review of a draft report on the accounting framework for biogenic carbon emissions. The Alliance for Green Heat and the New York State Energy Research and Development Authority recently announced that seven pellet stoves have been chosen as finalists in the Pellet Stove Design Challenge. The European Commission is seeking public input on its post-2020 sustainable bioenergy policy. The three-month consultation period began Feb. 10 and concludes May 10. Those who wish to weigh in are asked to complete a nine-part online survey. AEBIOM recently responded to the public consultation on the preparation of a new renewable energy directive for the period post-2020. The renewable energy package is part of the European Commission’s Energy Union Framework Strategy. Legislation recently introduced in Maine aims to support local pellet producers by encouraging public postsecondary educational institutions to give preference to Maine producers when entering into heating fuel contracts. On March 3, two subcommittees associated with the House Committee on Science, Space and Technology held an oversight hearing on the U.S. Department of Energy’s loan guarantee program. Abengoa projects were among those discussed during the event. On March 3, the U.K. Department of Energy and Climate Change launched a consultation on reforms to the Renewable Heat Incentive. The USDA recently published a fact sheet highlighting its investments in rural America, including several related to sparking innovation in America’s bioeconomy to support the development of biomanufacturing and advanced biofuels. On Feb. 24, the House Committee on Agriculture held a hearing on the state of the rural economy featuring testimony by Agriculture Secretary Tom Vilsack. Biofuels and bioenergy were among the topics discussed during the nearly three-hour event. AEG CoalSwitch, the renewable energy division of Active Energy Group Plc, recently announced it has received the results from the burn testing of its CoalSwitch fuel at the University of Utah's Clean and Secure Energy Institute. The Northern Forest Center is expanding a program that helps Vermonters switch to high-efficiency wood pellet boilers to provide heat for homes, businesses and other properties in the Northeast Kingdom. The board of directors of the Biomass Thermal Energy Council officially announced the appointment of Jeff Serfass to take over for Joel Stronberg as BTEC's executive director. Serfass led the organization in its formative years in 2009 and 2010. Sumitomo Corp. recently signed a contract to acquire up to 20 percent of Cosan Biomassa S.A., a subsidiary of Cosan S.A.Industria e Comercio, and producer of sugarcane pellets for power generation.